Choose an item (or items) to paint from our extensive collection: plates, bowls, cups, vases, figurines and lots of kids’ pottery. Each piece of pottery varies in price from $7.00 to $80.00. Prices can be found on the bottom of each piece. 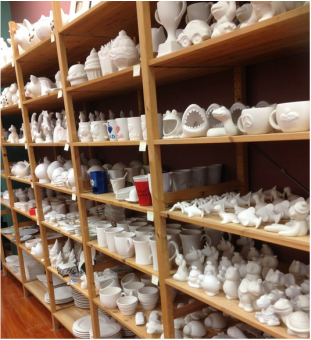 Our studio is ALL INCLUSIVE, which means the price includes all of your paints, supplies, materials as well as the glazing and firing of your piece(s). We accept all major credit cards and cash. Payment is expected at the time of painting. This is the fun part! It's time to get to work and design your piece!. We supply all the paints, stamps, stencils, and other materials you need. Step 4: Pick up your Piece! Your piece(s) will be fired in 2 - 3 weeks and we will notify you by email when your piece is ready for pick up.